The new fissures, first observed early this morning, are approx 1-2 km long and there are some indications that some activity could have started beneath the Dyngjujökull glacial ice (perhaps increased gas emissions only at the moment); the observed depression on the glacier have deepened – as a result of melting beneath, likely from new (eruptive?) fissures developing there. New eruptive fissure in the Holuhraun eruption is much closer to the Dyngjujokull glacier than the previous ones, and creeping towards the glacier, says volcanologist Armann Hoskuldsson, who surveyed the new fissure this morning. Volcanic tremor indicates the fissure opened around 4 AM. Geologists working near the Holuhraun eruption north of Vatnajokull have been called back, as increased volcanic tremor has been detected in the vicinity. GPS measurements show that the magma intrusion has increased since the beginning of the current eruption and a rift valley has formed. Seismometers at the Icelandic Met Office have in recent minutes shown increased low-frequency tremor at stations near the northwest part of Vatnajokull. The Civil Protection Agency has now called everyone back who was near the fissure in Holuhraun, due to concern that the eruption could be getting bigger, or that magma could break the surface at another location. No changes in the eruption have as of yet been confirmed. 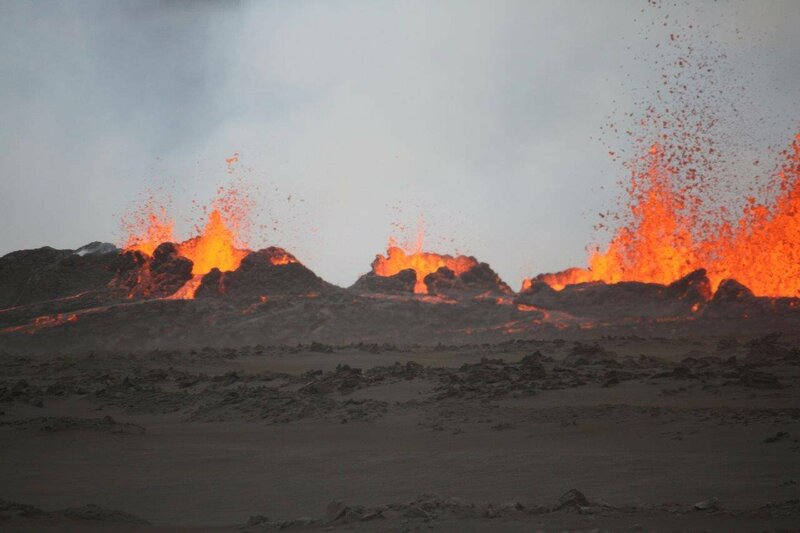 According to the conclusions of the latest Scientific Advisory Board of the Civil Protection Agency, posted at noon today, the volume of the dike intrusion from Bardarbunga volcano towards the north has increased since the beginning of the current eruption in the Holuhraun lava field. This is taken to signify that more magma is entering the dike than is being erupted. Iceland’s Bárðarbunga volcano began erupting once again early Sunday morning — with lava flowing out of a mile-long fissure in the Holuhraun lava field. This eruption is not producing clouds of gas and dust, which could produce world wide climate change like previous Icelandic eruptions. So far it does not appear any of the the eruption is taking place under the glacier, but stay tuned. This entry was posted in Analysis, Climate, Volcanic. Bookmark the permalink. Things are really heating up,, and now an explosion is now feared to happen.. and soon. The tell tail “rotten egg” smell from the melt water. Russ.. When can I officially say,, “called that one”? In September 2003 I spent 5 days in Reykjavík doing some engineering work for a Michigan based air cargo carrier. Hotel prices weren’t that bad, but I was on expenses for the trip. Food was a challenge. Although I like ocean fish, I found the breakfast, lunch and dinner menus were 90% fish. Most interesting to me was their creative use of geothermal energy. They harness it not only for electricity, but for home and business heating as well. In populated areas, there are no gas mains, just steam mains. Nice people, whose language closely parallels Norwegian. I would not want to live there during winter. Looking at those pictures and tying them to all the volcanic activity reports over that last gazillion years, was Iceland ever meant for human habitation? I would not want to live there. One of my daughters stopped there over night stop on a flight, to save money and the cost of food and lodging wiped out all the potential savings. Had a great time basking in the thermal pools.